More than 325 Southland residents gathered in Hawthorne on Saturday, Jan.18, to celebrate the legacy of Martin Luther King, Jr. The event was co-hosted by the South Coast Air Quality Management District, state Sen. Roderick Wright and state Assemblymembers, Steven Bradford and Reginald Jones-Sawyer. It featured guest speakers, Donzaleigh Abernathy, daughter of the late Rev. Ralph Abernathy, and Denise Nicholas, an award-winning actress and author. During the event held at the Hawthorne Memorial Center, Donzaleigh Abernathy, author of “Partners to History, Martin Luther King, Ralph David Abernathy and the Civil Rights Movement,” shared her reflections on growing up with King, who she affectionately called “Uncle Martin.” Her father was a close friend of King and another pillar of the American Civil Rights Movement. 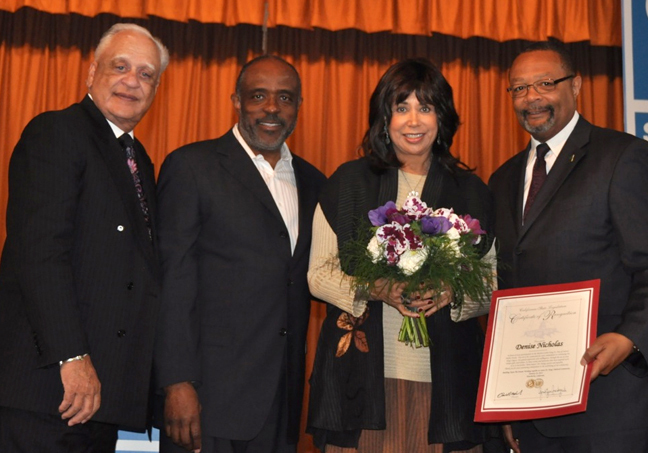 Denise Nicholas shared her involvement with the Civil Rights Movement. She has starred in television shows such as “Room 222” and “In the Heat of the Night,” garnering three Golden Globe nominations, three NAACP Image Awards, and two Emmy Awards. SCAQMD Chairman Burke, Senator Roderick Wright, and Assemblymember, Reginald Jones-Sawyer delivered opening remarks at the event.